The use of participatory notes (P-notes) by overseas investors is on the rise. According to a report in the Business Standard, P-note issuances with Indian equity derivatives as the underlying product are at a three-year high. While this is no reason for policymakers to be worried, it does serve as a reminder that the onshore derivatives market needs further development. P-note issuances with derivatives as the underlying product have risen by 60% between end-January and end-October, according to the latest data released by the Securities and Exchange Board of India (Sebi). 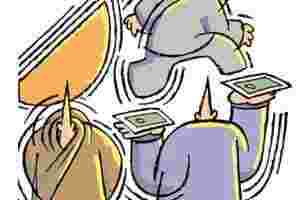 At ₹ 63,527 crore, they amount to around 6.2% of the total stock holdings of foreign institutional investors, or FIIs. In January, P-notes that had Indian equity derivatives as the underlying product amounted to only 3.7% of the total FII holdings. The thriving offshore derivatives market should serve as a wake-up call for policymakers. Reforms in the onshore equity derivatives market are long overdue. A large part of the trading happens in near-month index options and index futures. There’s little interest for single-stock options and long-dated contracts. And while a Sebi-appointed committee had recommended introducing over-the-counter (OTC) derivatives nearly three years ago, there’s no policy initiative on that front. Meanwhile, foreign brokerages are able to structure derivatives according to client needs using the P-note route. The large amounts of outstanding P-note positions suggest there is high demand for these products. This is another clear example of an export of a segment of India’s financial market. This is not to say that policymakers should allow OTC products so that overseas investors can trade in exotic derivatives. These products will also help Indian institutions hedge their financial risks better and will be beneficial for the market in general. For the same reason, policymakers need to give more thought to the development of the domestic securities lending market.